I know we have a good number of motorbike riders, but are there many bicycle riders here? I ride a bike for fitness, and will on odd occasions pack a lunch, or gear for a brew of tea; but do many people use a bike for touring/camping? Is it a campground to campground affair, or do you stealth camp along the road? What do you use for a bike and gear? How about backwoods work on a mountain bike? Staleym, Brain Farts Too Much, throwback and 2 others like this. I ride my bike all the time for transportation mostly, however I load it up for camping..etc. all the time, not often a campground affair, I just mostly find a spot and setup. Forestcactus, Sosteve, Timex and 3 others like this. Big time. I have a "few" bikes and enjoy riding them all. I have bike camped my way across the state on my own and within a supported large group. It's obviously a lot easier when someone else is carrying the camping gear, but I'm not much for being in the middle of a large group, so there is a tradeoff. 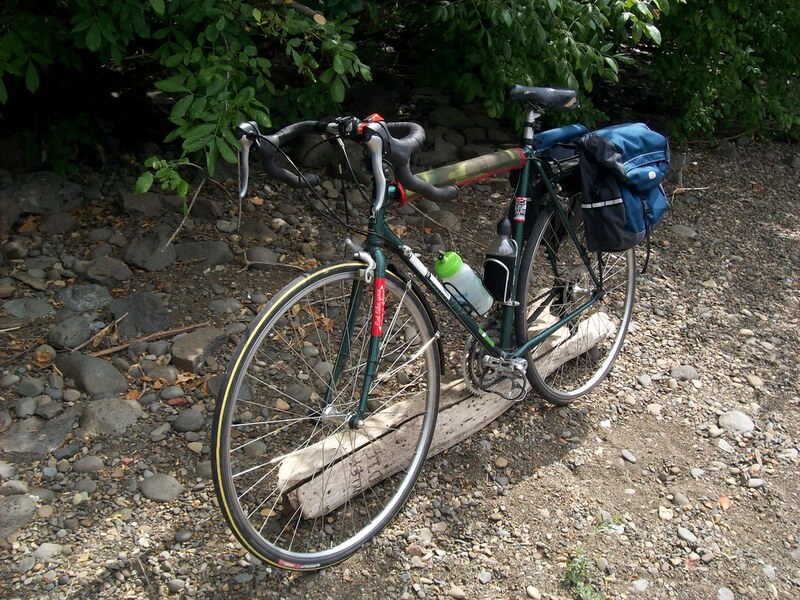 For hauling gear, I have used a trailer, panniers, and a combination of big baskets and saddle bag. I prefer the baskets/saddle bag method, but only if the front basket is mounted on the frame rather than the handlebars. Overnighters are my favorites... it's just much easier to pack minimal gear/supplies/stuff for a shorter trip within a limited timeframe. None of these is set up for camping in these pictures, but the idea is to have a solid, comfortable, well fitting bike and a generous sized bag for hauling your gear. At a minimum, I always carry a good set of tools, oil, lights, rescue inhaler, velcro reflectors, cash, first aid kit, plus food/snacks/ whatever. Decent rain gear plus a couple of plastic market bags go a long way here in IA with sudden weather changes this time of year. Also, I have converted all my bikes back to platform pedals in a revelation that occured a few years back, after being a click-in guy for twenty years. Much more comfortable and easy, with little performance loss. Staleym, LarryB and melbolt65 like this. Do you find some campgrounds are more biker friendly, or will any accept a bike rider same as a car camper? Staleym and melbolt65 like this. Sometimes, also at least out here many campgrounds have a hiker/biker spot where its only like $3 a night and you are far away from the car/rv campers with the loud kids running around and generators kicking on...etc. I bike daily and occasionally go on long rides(2-3 hours) my bike is a fixie with no brakes and I love it. LarryB, JimT86 and melbolt65 like this. I've never had any problems at camp grounds, but I have passed up a few that rubbed me the wrong way. Key for me is finding a camp site early enough to allow a margin for contingency. My preference is to find a peripheral site, affording as much privacy as possible. Awareness and precaution in public areas are important. When I'm camping I travel with a few small locks in case I have to step away from my gear, some of which I keep with me at all times. I am sooo glad this thread got started. I have been a rider for as long as I can remember. I want to build my own small travel trailer to pull behind this bike. I want to build it out of aluminum and coroplast so it can fold out into a sort of fully enclosed cot. I have to get some bags too for the rack. This is my $15 Garage sale Fuji Regal. I ride it daily. My Wife's centurion also a garage sale find but paid $25. She rides on weekends with me. Staleym, Timex, LarryB and 1 other person like this. Staleym, Ugly_Barbarian, melbolt65 and 1 other person like this. Dude that's nice. I get the walker bu what did the other part come from with the wheels. I've been over engineering this with tig welding tubing. I can't tig either. Nice work here. 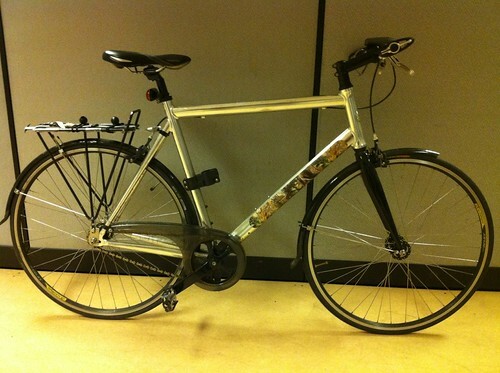 I have a Kent brand folding bicycle with 3 speeds. 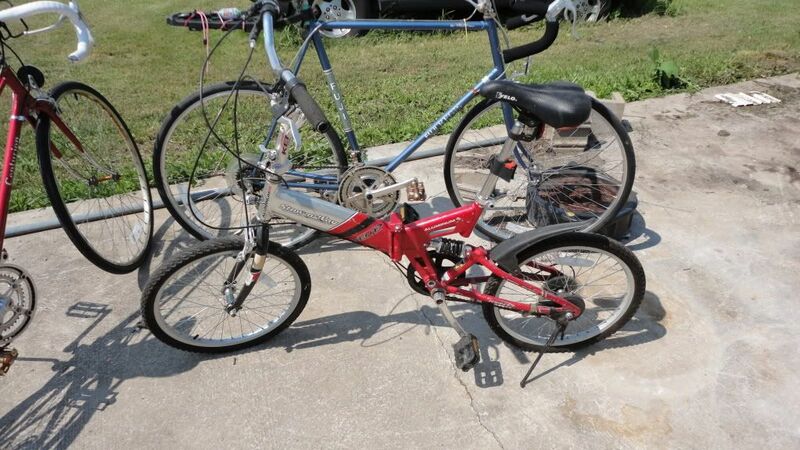 It has a long pedal crank too. I used to keep it in the big rig for exercise when I had to stop for a 34 hour log book reset. I found a lot of parks that way that other truckers were to lazy to ever look for. LOL. Timex, LarryB and James MacRae like this. RiverJoe, I think you're my hero now. I need to do more dumpster diving. It's amazing some of the stuff that gets thrown away. WW1, Great thread. I hope I'm not hijacking it. Real excited about this type of camping. I've done it a lot as a kid. I used to have a tent and some clothes. I'd work around the neighbor hood for $4/HR and crash where ever I finished working. Many times in my tent inside an old barn. Age 14-16. Brionic, That's the first time I have ever seen the shifters on the ends of the handle bars like that and there are 2 bikes that way. Very interesting. Not sure I would like it, gonna have to try that out. Thanks. Edit: all three bikes are that way. I had to check to see if you were from across the pond. Is that a custom setup ? Very interesting. for about three years now and absolutely love it. I don't drive (my choice), and I'm blessed to be in a locale that has decent public transportation, even if it's considered the boondocks. 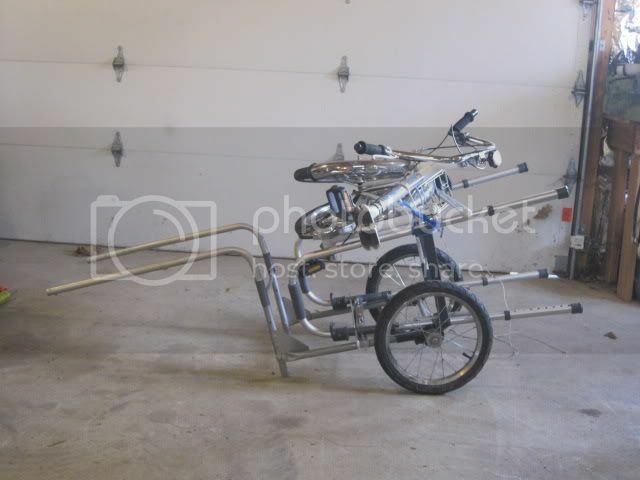 As I lose more weight, I'm going to go to a bike shop and invest in a decent bike that I can really get around with and use for camping and whatnot. i have been an avid bike rider for many years.. i ride both mtn. bikes and road bikes.. we live in a mtn. biking mecca, and have amazing trails all over the place..
i also didn't drive for a very long time and road my bike everywhere..
xj35s, they are set up that way because I like being able to shift from the handlebars rather than crouching down to reach the down tube. My bikes, like yours, are on big frames and even with my long arms I find it a bit of a reach, since I seldom ride in a racing position. The upshot is that having the shifters close means I can find my "sweet spot" with ease on an incline, decline, head wind, or squirrelly trail. They are called bar end shifters and are really nothing more than down tube shifters with an adapter to fit into the handlebar ends. Thumb shifters work equally well and are the same idea, just adapted for a different location. They can be had used online. Check Rivendell's site for info about them. 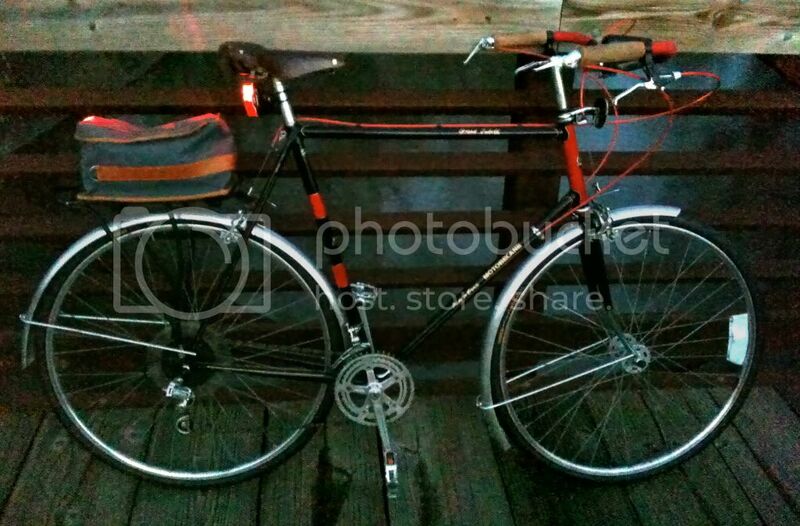 They are also sold by Velo-Orange, and you should be able to have a local bike store order them if you wish. New, they run about $75 plus installation. You will also need extra long run of cable and down tube "stops". If you are ever in the eastern IA area you are welcome to swing by for a look and ride mine to determine if you like them. That Kent looks like a sweet bike . Is it pretty light ? My current one is an Atlantic I bought off E bay . Its pretty heavy but sturdy , which I need (260 #) Ive had a couple of others that didn't hold up so well . Id like to get one of the army issue paratrooper type if I can find one at an auction or something . Edit: I am a die hard bicycle rider not a racer or anything but I ride every chance I get commute and pleasure. My bike is nothing special. 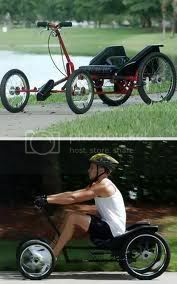 A long wheel base recumbent by Rans. It is a stock Stratus that I added chopper handlebars to this year. It had LED head and tail lights and fenders, otherwise just a stock bike. 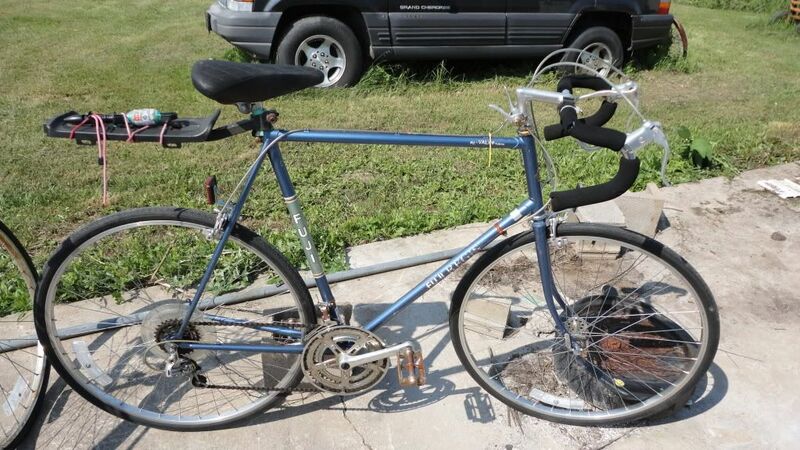 I recently got a Wally World special 7 speed Avalon cruiser bike which I ride mostly on the road and a 2 mile stretch of dirt levee. I need to get a cardio workout but I don't enjoy walking except in the woods. I opted for the lower top bar model for three reasons: 1. After 4 back surgeries I am pretty much stiff as a board lacking flexibility so the lower bar aids in getting my leg over it to ride. 2. I value my family jewels even though nowadays they are more for decoration than anything else though still hurts like ****! if I bang them against anything hard enough. Low bar keeps the boys out of harms way. 3. I LOVE the color blue. I am very secure in my manhood and the practicality of design was unquestionable. Besides this was the last Avalon bike on the island which made the choice that much easier. 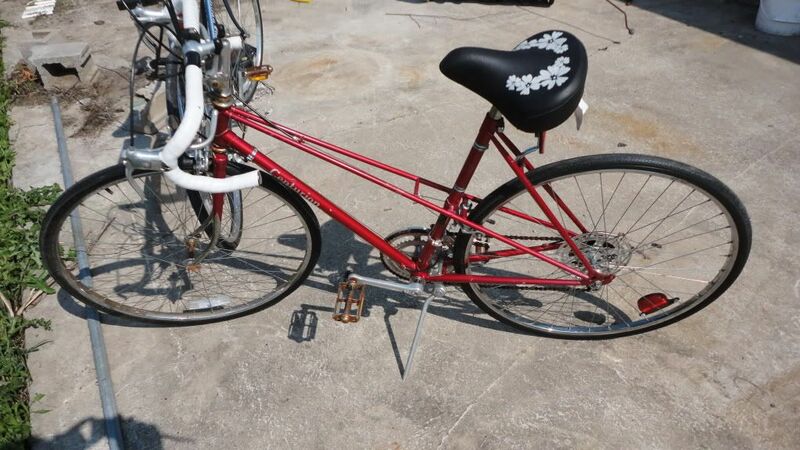 It has front and rear suspension (good for my bum back) and Shimano derailleur, and very nice brakes . Also a strong but lightweight aluminum frame. Best of all the price here in Hawaii was $114.00. I am a very happy camper/biker. Only problem is I tore a ligament near my knee cap a couple days ago so can't ride for several days until healed. I am slowly setting up my bike for camping. Though me I would love to stealth camp as possible. 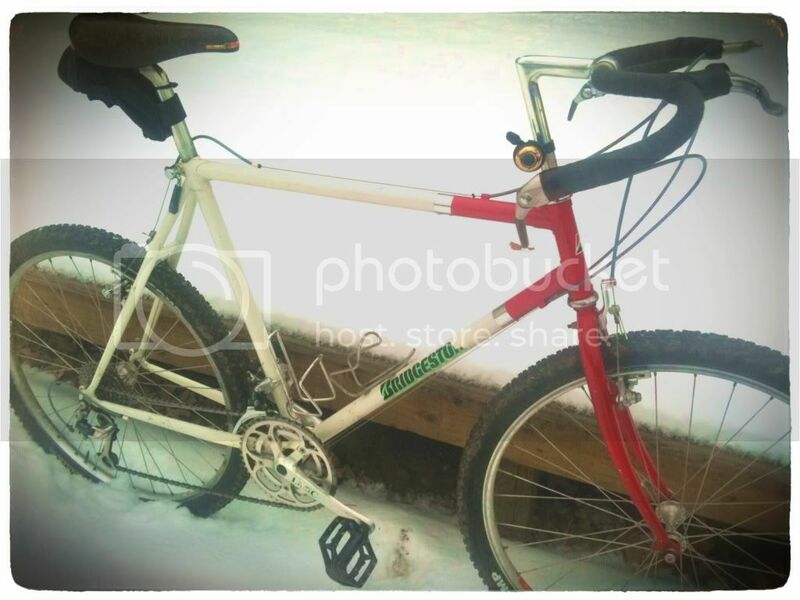 Bike I got for nothing got rest of the parts I needed from a Christmas gift this past year my ride is a mid 80s vintage Panasonic Sport 1000 12 speed. Mint condition. Those 80s era Japanese bikes have high quality frames and generally good to great components. Enjoy! We call them women's frames here in the US but in Europe and Japan the "mixte" is considered a practical, strong, unisex frame. Ride it proudly! I used to be an avid bike rider, where I live now there is no safe area to ride. 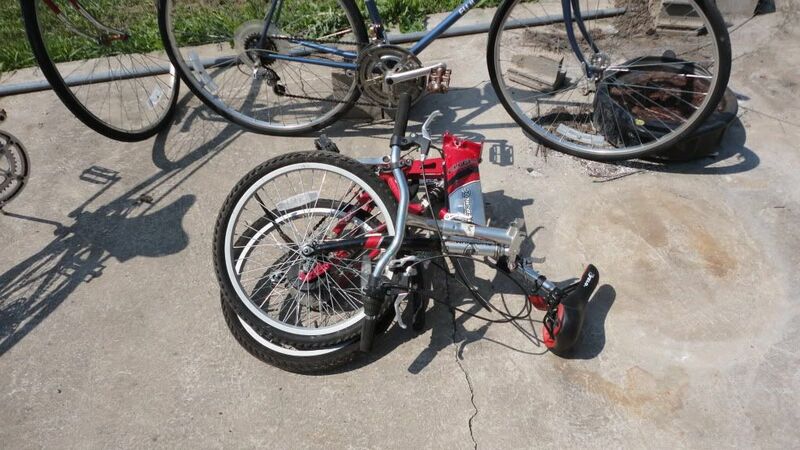 Your thread just woke up a big bug in me, I'm going to get that old bike out, clean it fix it and ride it. thank you. Sweet frames when you are short like me and got some crap loaded on the back. I dig the looks I get at times. Heck as my Mom always says it ain't what ya ride it's how ya ride and that you are riding Personally me though I do really dig the mixte type frames. I'm an avid cyclist and have ridden several centuries. 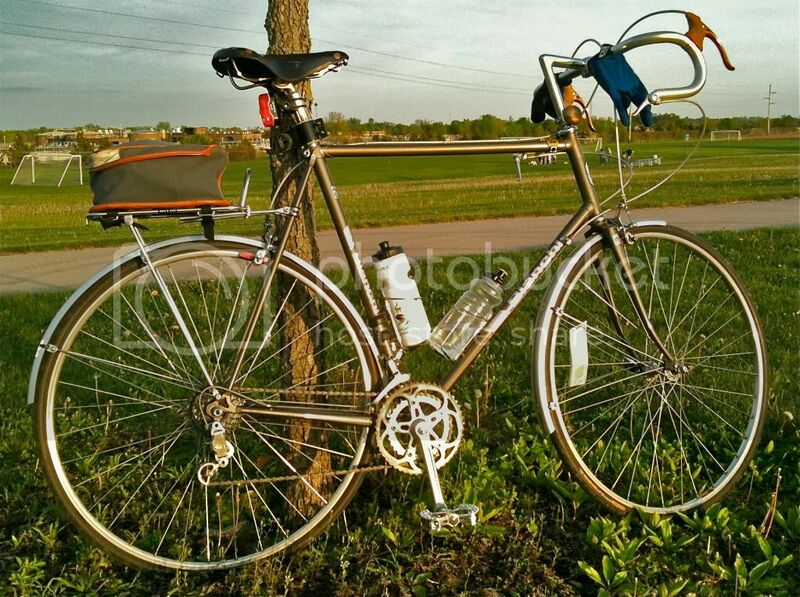 I ride a titanium framed roadbike made by Litespeed. I am usually trying to get pretty light in weight so I don't pull or haul anything. That Kent is hefty. I was able to lift it into the big rig and put it on the top bunk. It was a Volvo d12 with a condo. The top bunk had a netting that buckled to hold it up there. Might weigh 45lbs? Very tight. No slop in any of the joints and I have maybe 150 total miles on it over 4.5 years riding it. I'd get 15 to 30 miles on it between fold ups. I'm impressed with it. I ride on & off road for fun, I've been wanting to try camping with my bike but haven't yet. Might weigh 45lbs? Very tight. and it has to be somewhere in the 60-70 pound range, at least. No bunnyhopping with this hog! Here's my single-gear bike. I ride it daily on a 6-mile round-trip commute in the city. I found it in the back of a thrift store and bought it for $175. Maybe sounds like a lot, but it's an aluminum frame (Giant brand) and super light, came exactly as you see it (minus the rear rack), and fits my needs perfectly. Having the rack and a couple of panniers has totally improved my enjoyment of biking. I can haul most anything on the bike now. Haven't taken any backwoods trips yet, but next up is a set of all-terrain tires for that purpose. This lady rode a trike from North Carolina to Alaska and back, SOLO over 13,000 miles! For more 'mundane' riding and hiking, check out some of my vids. Not selling anything, just me and friends riding and hiking together. The journey and friends always being more important than the video product, and it shows. Once you get bent, you don't go back Love mine to death! He rode from Iowa down to Central America. Originally he had planned to make it all the way to his farm in Brazil and back, but had to postpone the second phase. I ride a bicycle to work and back (about 4 mi round trip) I also have used it to reach places that are more remote for camping. Not many camp off the bike trails. Timex and LarryB like this. I bike commute on occasion (when I think I'll have some energy left at the end of the day--horticulture wears you out) and ride for fun/fitness. I'd love to bike camp at some point, but I haven't gotten around to it yet. Here is where my bike has been since the day before I had a partial knee replacement 5 weeks ago....I am itching to get back out there. For me, it is usually an on the road, campground to campground affair but there's no reason it couldn't be done offroad in more remote areas. Mountain bikes are ideal for touring, on or off road. I haven't done much stealth or free camping but it's not hard. Campgrounds have advantages such as hot showers and wifi. In California State campgrounds bike camping is $5 a night, no reservations required. This summer I'm doing a single speed bike tour from San Simeon to Big Sur and back. I'll be sleeping under a poly tarp pitched as an a-frame with hiking poles. The bike for the single speed tour. View from the cockpit, moustache handlebars. View of rack. Clamps on seatpost only. "Wings" keep panniers out of spokes. One gear, no shifters, no derailleurs. Camo poly tarp a-frame with hiking poles. Are you touring solo or with a group? Please don't try this on an active Rail Road . Here is my bike. I like to load it up and ride out to a local woods several miles away and camp. LarryB and shotgunpapa like this. Thanks, just me and my buddy who's also also riding the same set up as me. There are so many bicycle campers somebody ought to start a bicycle expedition thread or extend this one . Id kinda like to see what everbody packs and how they pack it and where they go . This thread is getting interesting for sure. I miss my Gaint ATX 760. I bent the frame in a move and was to disgusted I tossed the whole thing. It had Shimano deor dx system. Dumb. I think bushcrafting and bikes go hand in hand. Maybe some day there'll be a website call BushBikingUSA. GeoKrpan, You are the second one to post something I have never seen before. 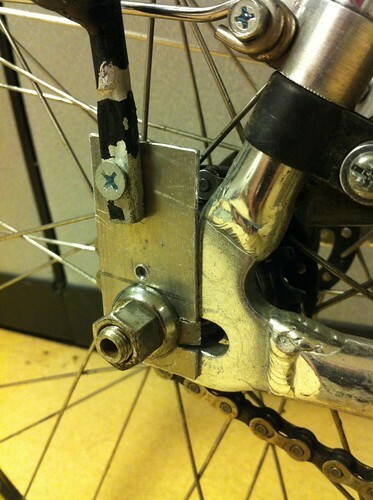 The handle bar shifters and your Vilano has a sprocket on both sides of the rear wheel. That would make adding a motor so simple. Even if only a battery powered one. Was that it's purpose? Glad I found this bc I just started getting into bike riding a little over a month ago. Please keep it going bc I am really enjoying it.